Founded in 2004, London developer Nitrome has made a name for itself over the years creating a bunch of quirky internet-based flash games and mobile titles. Now, the company has made its next big step with the release of Bomb Chicken on the Nintendo Switch - an action puzzle-platformer equally as bizarre as its previous concepts. 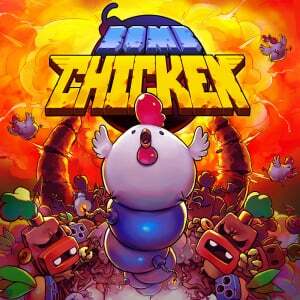 As the name of the title somewhat indicates, this is a game about a bomb-powered chicken. Don't be fooled into thinking the bird is a distant colleague of the iconic 'man', either. While there appears to be some inspiration derived from the Bomberman series, there are also many other influences fuelling the design. The story behind this outing would no doubt have animal rights activists up in arms if it were real. Fortunately, this is an entirely fictional plot, so it's safe to say absolutely no poultry was harmed during the development cycle. In fact, if anything, this is actually a revenge story, where you take control of a heroic bomb-laying free range hero intent on taking down 'BFC' (an obvious parody), after a freak accident with the evil fast food corporation's blue hot sauce. With the motive clear, progression is rather straight-forward in terms of design. You travel from one level to the next, as the plucky hero works its way through three worlds in total. The feathered protagonist is quite distinctive with no real skills save the ability to lay bombs at a limitless rate. This requires you to apply some thought to each challenge. Tasks such as jumping across a pit of lava from one ledge to another will call for slightly more effort than usual - with the requirement being to stack bombs underneath the chicken in order to take the necessary leap of faith. A similar process is needed to reach higher ledges. Other puzzles throughout levels have you kicking and bouncing bombs to destroy barricades and enemies or activate switches - much like Bomberman. There is added complexity, with locked off areas requiring swipe cards and pressure sensitive triggers able to be activated by bombs. Each level expands upon these basics over time. There are even secret rooms filled with gems. 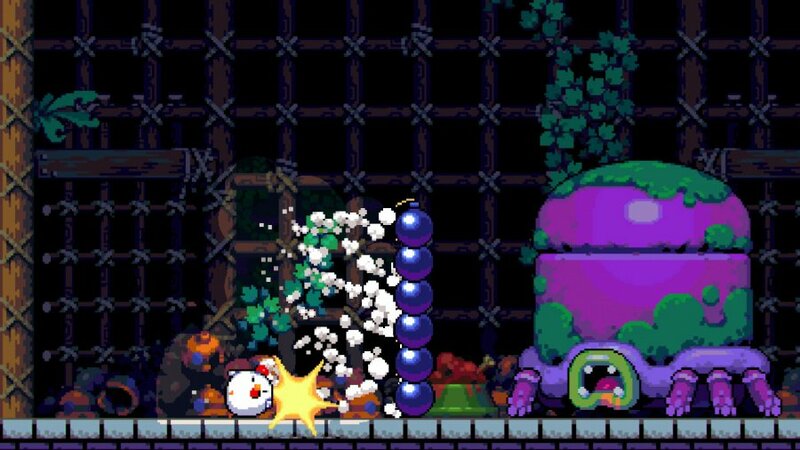 After a while, the bomb-laying mechanic becomes second-nature, which is evidence of how well it has been implemented. 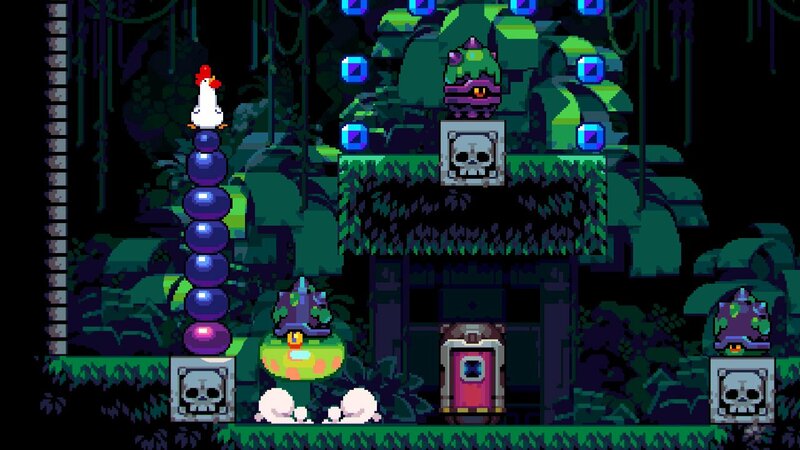 The 29 levels across the three areas in Bomb Chicken are made up of conveyor belts, meat crushers, spikes, dangerous spinning cogs, blocks, launch pads, warp pipes and plenty of other appropriately themed traps. All of these combined ensure you get just the right dose of platforming and puzzling. Eventually, many of the levels include multiple pathways that must be navigated in a certain order before completion. 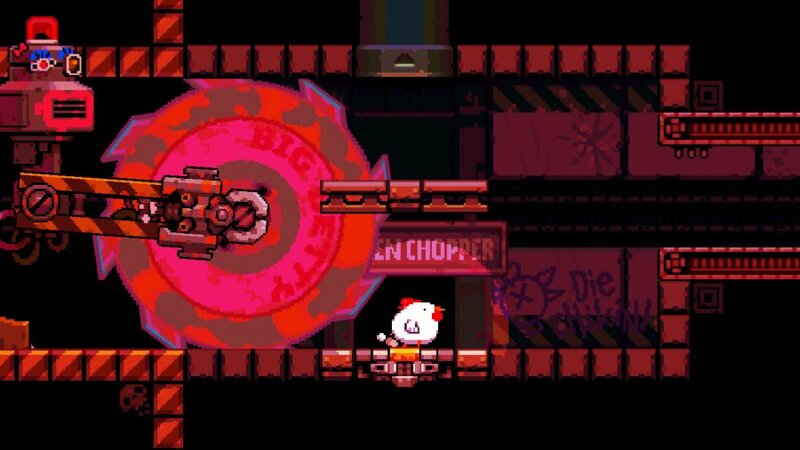 Common scenarios you might face can include having to hide the fat chook in a safe space on a conveyor belt - using the assistance of bombs, and in other areas, you might have to outpace a giant mechanical threat - reminiscent of scenes from Super Meat Boy. Despite the fast-food focus, the theme of the game draws ideas from ancient civilisations - with plenty of references to temples, tribes and even fictional chicken gods. Not only will you have to deal with BFC employees, you’ll also be taking on the local natives and wildlife. It’s simply a matter of outsmarting the spear-wielding enemies who will cause you problems when you are trying to solve a puzzle. Bombs generally make quick work of enemies - provided you attack at the right angle. Often you'll need to stack of them or send a few flying in a certain way or you can halt any impending threats by creating a barricade. You can also bounce on enemy heads (if they have them) to solve the problem. As you progress, you'll encounter more varieties of enemies, all with different patterns. In addition to this are boss encounters – again, these events are all designed with the use of bombs in mind. If you take too much damage, it’s game over. The challenge increases quickly, but shouldn’t be too hard to overcome if you persist. You can upgrade your life points as well, if necessary. Overall, each level has a good sense of flow to it, and the precision required feels similar to Mutant Mudds. The controls are just as responsive as well, with easy controls and utilisation of HD rumble. In terms of visuals and sound, Bomb Chicken captures the spirit of retro platform games perfectly. The music emphasises the foreboding nature of the environments, the bombs sound just as you would hope and there are plenty of noises right out of the chicken coup along with dripping pipes and deadly machinery. Visually speaking, this title looks like a combination of Mutant Mudds and a castle level from the Super Nintendo hit, Yoshi’s Island, with beautiful pixel art on display. Each environment does a great job of capturing the harshness of the situation, and the chicken, enemies, and hazards are all charmingly animated. On the big or small screen, the game runs smoothly and looks great. 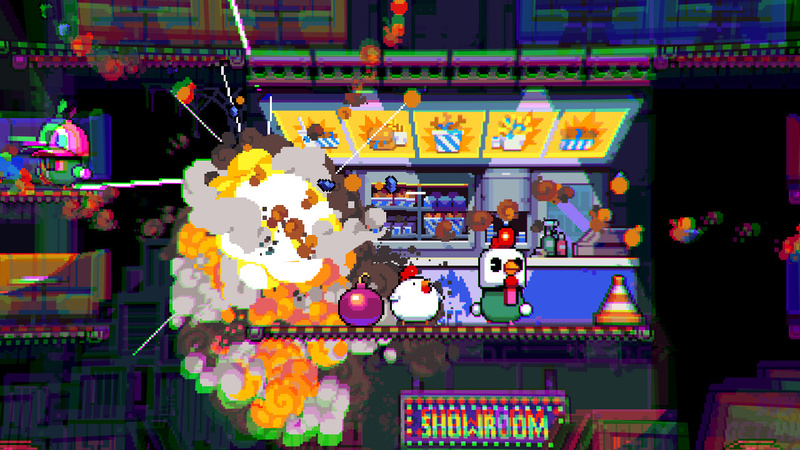 There’s nothing particularly revolutionary about Bomb Chicken, it’s enjoyable predominantly because of its classic approach and how refined each aspect of the game is including the core bomb-laying mechanic. Each level is intelligently designed and has a great sense of flow. The puzzles and enemies are fair but challenging and the controls are precise and responsive. Unlike fast food, this isn't a cheap, quick and nasty solution that will leave you regretting your purchase - this is a blast. Definitely in my gaming pecking order of purchases. But waiting to pluck the physical copy off the shelf. Was afraid this was gonna be fowl but pleased it’s eggs-cellent. I’ll be chicken the eshop for this on Friday. I was afraid the devs would wing it. I’m scrambling for more yolks. That chicken might be eats a lot of Chemical ingredients such as TNT Powder, to produce Bomb Eggs. I actually got to play this a couple weeks back as I was able to snag it when the game was briefly put up on the eShop for purchase on the June 28th (the original release date before it was briefly delayed) by mistake. Great game, could do with a bit more content though. It was all over a bit too quickly, though I guess it's better to leave them wanting more than to not deliver the goods in the first place. I didn't read the review, too lazy right now. But I do know that this game is a puzzle platformer, I'll keep an eye on this one. I have better things to do with $14.99 and my time. More random games. @Mgene15 You keep using that word. I don't think it means what you think it means. Will have this at some point in time... same as Panic Pool or whatever the name is! Fresh and good looking. I've always been a fan of Nitrome's works for a long time, and I will definitely purchase this a few days after its release because I'm a petty person. From the moment I saw this game I thought it had potential. I can’t wait to see for myself. Glad NL likes it. I knew this game looked awesome, it's a real breakthrough title for the developer if it sells well. @Magrane is it legit getting a physical release? Glad to hear it's good! I used to play Nitrome's Flash games all the time so seeing them finally come to Nintendo consoles made me so happy! I’m a fan of chickens in general, somin thr wishlist it goes! Now some bring forth a Chuckle Egg! This looks like so much fun! Looking forward to it. I came here for the review, and stayed for some poultry/egg puns, and wasn't disappointed on either count. Thanks guys. @Mgene15 "Shovelware" is probably the only word in your vocabulary. Try learning new words. You'll have a blast doing so. I think the price is a bit high but I'll dip in when it's on sale. I have my eye on this one. I am currently playing Shining Resonance, but I am in for a good puzzler. It will be on my wishlist. This game is flat out fantastic, and if this is "shovelware" feel free to smack me with this shovel anytime. I've been playing it for about a week and a half or so and can't get enough, it's absolutely amazing, top to bottom. I was hoping this would be good. Will pick up later. @brunojenso Pretty sure that guy is just trolling the comments, calling this shovelware only waters down the meaning. I should know, I call out a lot of games for being lazy, shovelware, or over-saturated, but this is clearly something that took a lot of effort. @NImH Not that I know of. But I'm willing to wait. I'm avoiding the feeling of regret if I make this purchase and then a year later there's an announcement. Has happened before! @Mgene15 There’s a lot of shovelware on the eShop. Don’t lump Bomb Chicken in with that junk though. This is a good one. @JayJ Agreed - back to the don't feed the trolls approach. It's just sometimes not replying to an idiotic comment from a troll might mean others start using the same words incorrectly too. I have really enjoyed my time with this game. 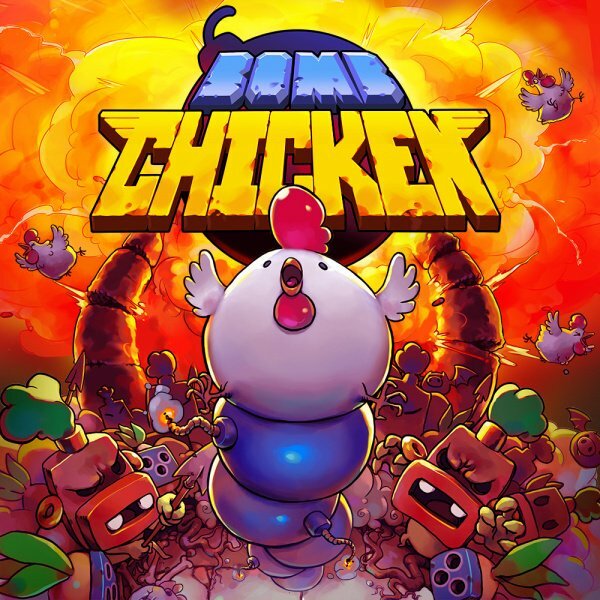 Great puzzles (just like captain toad... the chicken can't jump so it forces you to think creatively), and animation on the fat bomb laying chicken never gets old. @JJ286 Nope. I was just commenting that I'd rather wait for the physical version, because in the past I have felt burned after picking up a digital copy and then a year later, it's announced that a physical release will indeed come out. Nice review and nice score. I really thought I'd love this but I don't like it so much. Love the responsiveness and the animations, but it's hard, and sometimes in a way that doesn't seem fair. I keep blowing myself up and not completely understanding what I did wrong, and how to change it. I feel that the central mechanic is not as well honed as in something like Celeste. @Whalehome It's been a couple weeks since I beat the game, but if I had to give an estimate I'd say over five hours, but less than ten. @geshem I had this problem until I realized that if one stack of bombs is too close to another stack of bombs, they'll all go off in a chain reaction. Once you realize this it's a simple enough thing to keep an eye on placement in situations where you've gotta quickly build one stack of bombs after another. Personally, I found the game just hard enough. It never took me more than a half dozen or so tries to beat any one level with all gems acquired. The final boss took a few more tries than that, but I had fun with the game and never felt it got too frustrating. @Magrane As far as I've heard the only physical edition planned for this is from Limited Run Games. Those are notoriously hard to get your hands on because they really are limited to a single run and always sell out fast. @Donald_M Oh really? That's eggs-citing! I'm going to order it - was it announced at E3 by then for this year? I did think this looked interesting, although the graphics look rough but for a few quid might be worth a purchase. £12? Your review gives no indication as to the value for money of this game, how many hours of gaming for the cost or replay value. It sounded more like instructions on how to play the game. I had my eye on this since it was unveiled and picked it up this week since it was on sale. I'm about 13 levels in so far and it's a solid experience. It reminds me of one those SNES games that was just a random platformer with a quirky hook like Boogerman or Bubsy that's really solid. It's also a nice change of pace after beating Hollow Knight. You didn't list one negative in this review...as such, shouldn't this be a 10/10 then? What you said about limited run is purely wrong. It's easy to get physical games. They are not printed in a limited number forcing you to act quick. They are open for pre-orders for usually at least two weeks. During that timeframe the quantity are unlimited.